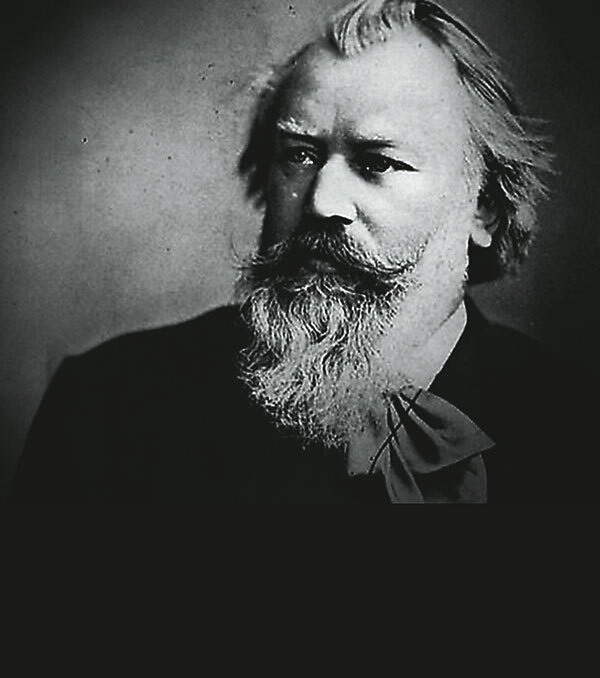 Intricate and often spellbinding, rare techniques are increasingly being brought to the fore by watchmakers…. 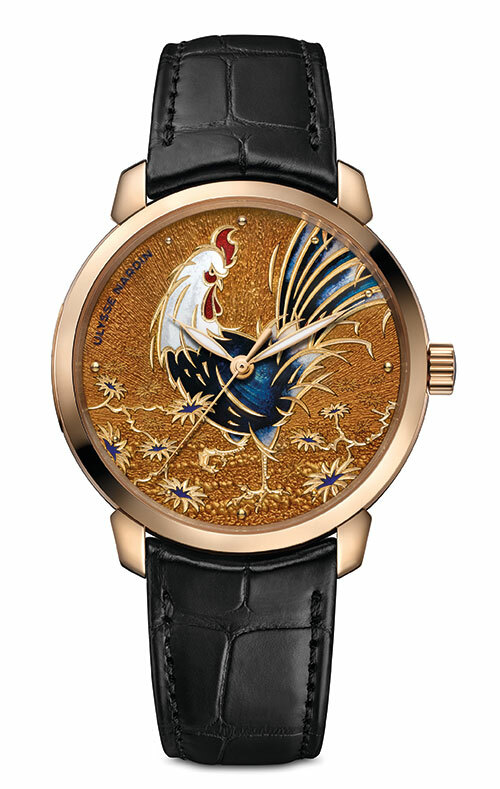 Celebrating the year of the rooster, the brand employs the champlevé enamel technique to bring the Classico Rooster to life. Carved with a chisel directly on the dial, the image is filled with enamel, the colours of which come from the careful blending of different metallic oxides. The bird’s body is decorated with blue and white within an opulent gold outline, complemented by luminous tapered gold hands. A range inspired by Nicolas Copernicus and the history of great astronomical discoveries, the Métiers d’Art Copernicus Celestial Spheres 2460RT pays tribute to heliocentrism with a dramatically ornamented display. Three different dials flaunt laser and hand engraving as well as grand feu enamelling — echoing the depictions of Andreas Cellarius, a 17th-century cartographer and author of the baroque-style sky map Harmonia Macrocosmica — against a white-gold case. 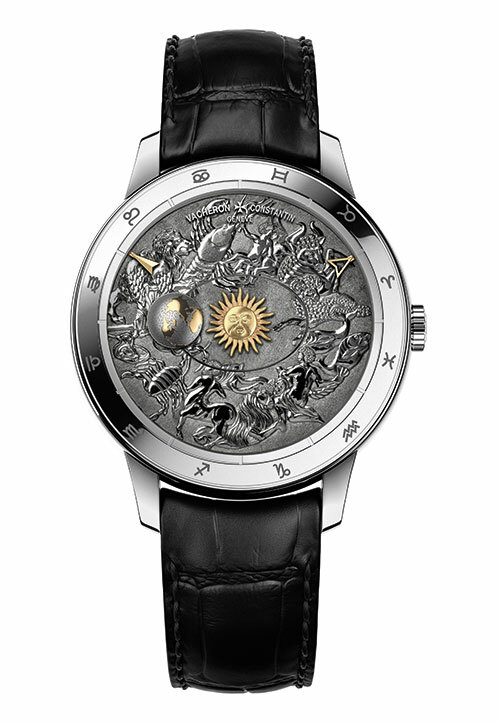 Twelve stylised engravings on the bezel depicting the zodiac signs can be observed along with the rest of the ornamentation, through a magnifying glass that comes with the watch. A pair of exquisite enamel dials shines on the Calatrava Azulejos 5089G models, in the honour of Portuguese ceramic tile art. 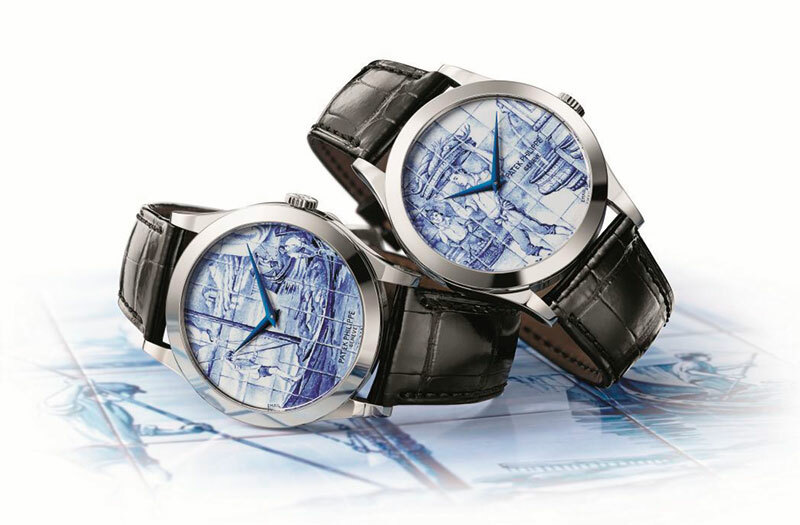 Equipped with the renowned calibre 240 ultra-thin self-winding movement, the watch features trompe-l’oeil so refined that it resembles the appearance and texture of the original tiles. 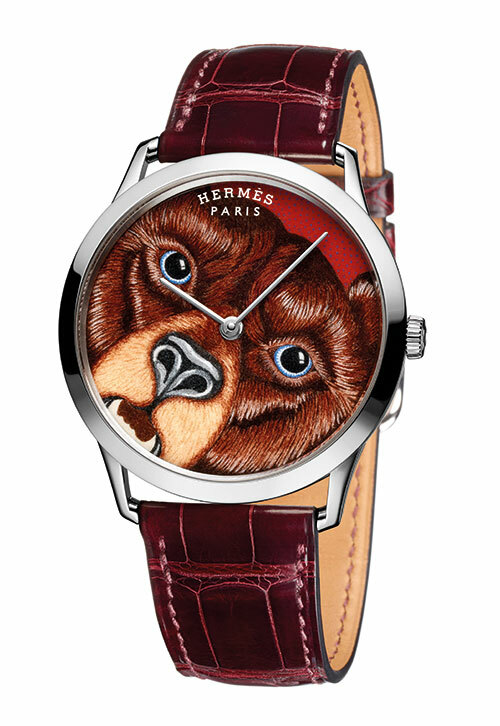 The luxury house’s newest artistic model and most humorously named timepiece so far, the Slim d’Hermès Grrrrr! showcases a detailed depiction of a grizzly bear which first appeared on one of the brand’s silk scarves designed by illustrator Alice Shirley. 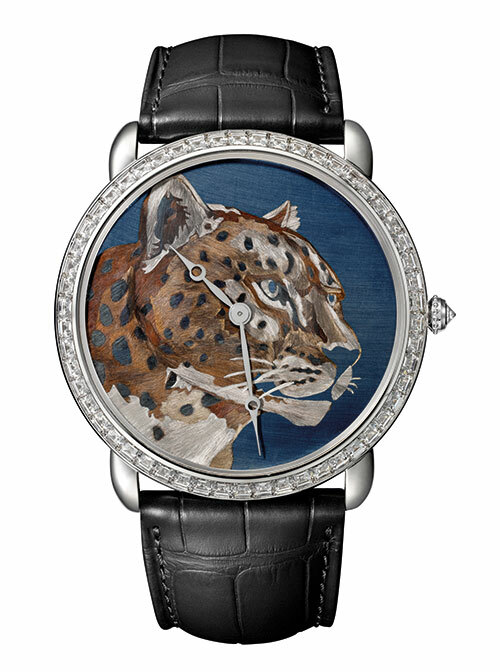 The enamelled miniature painting is done on a white-gold base and is protected by a sapphire crystal, while the caseback has an anti-glare treatment. Inspired by the Mexican festival Dia de los Muertos, or Day of the Dead, the Eternity timepiece is part of the designer’s coveted Petit Celebration Skull collection. 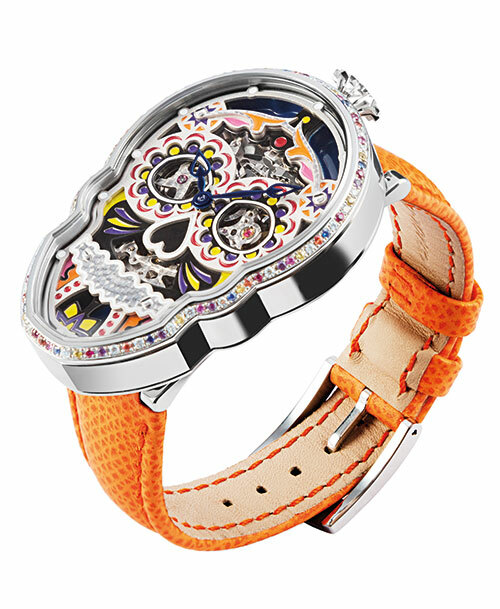 The three-layer dial is hand-painted, building up like a pattern to reveal a colourful skull by day and its luminous outline by night. The stone-set bezel features seven colours, each representing a day of the week. A matt black PVD-coated case acts as a bold frame, held by a hand-stitched calf leather bracelet. With its one-of-a-kind dial and mechanics, the Loving Butterfly Automaton is a feat of technical and aesthetic prowess. Just a push of the crown button brings an 18-carat gold butterfly to life, pulling behind it a cherub in a chariot — the wheels of which begin to turn in an illusion made possible by the combination of fixed and mobile spokes. The watch is powered by the automatic calibre 2653 AT1 with an exclusive automaton mechanism, a triple barrel and an oscillating weight in 22-carat gold. 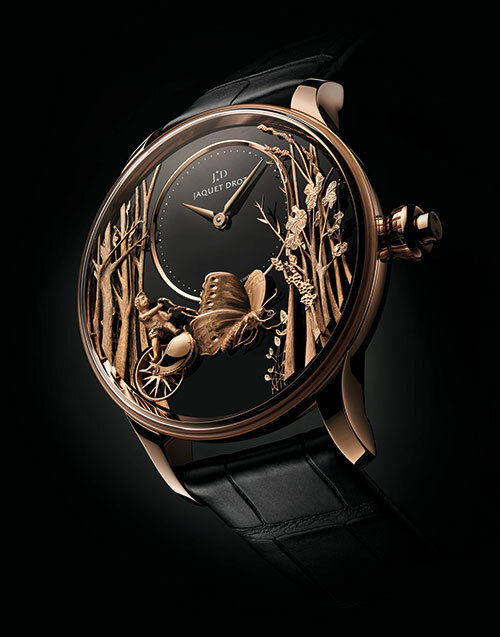 The Grand Soir Botanic line, composed of unique flower-inspired wristwatches, features three-dimensional and detailed dials. 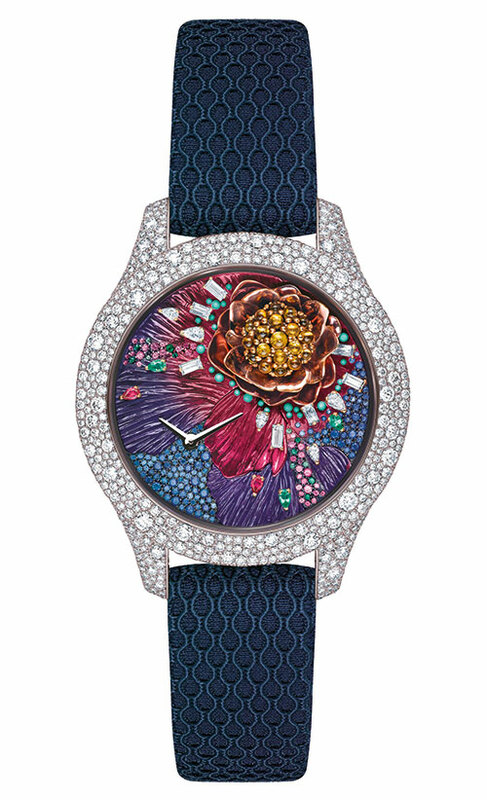 Rendered in diamonds, sapphires, garnets, mother-of-pearl, emeralds, opals and rubies, each masterwork is equipped with a quartz movement, polished gold caseback and midnight blue fabric strap. Kicking the heat up a notch, the Ronde Louis Cartier XL Flamed Gold watch presents a striking representation of the brand’s signature panther, using the principle of oxidation. Heat is evenly applied to the solid gold dial since higher temperatures result in a deeper blue. Parts of this oxidised layer are brushed off in a manner that resembles the texture of fur. The process is repeated many times, until the softest hues of brown and beige are also achieved. Crafted in 18-carat rose gold and in the brand’s cherished shakudo alloy, this head-turner is an ode to Switzerland. The breed of cows from the Val d’Hérens, depicted on the Métiers D’art Shakudo ‘Battle of the Queen Cows’, has long been a part of the Swiss national heritage. On the dial, they are depicted against the legendary Matterhorn — Switzerland’s best-known mountain. 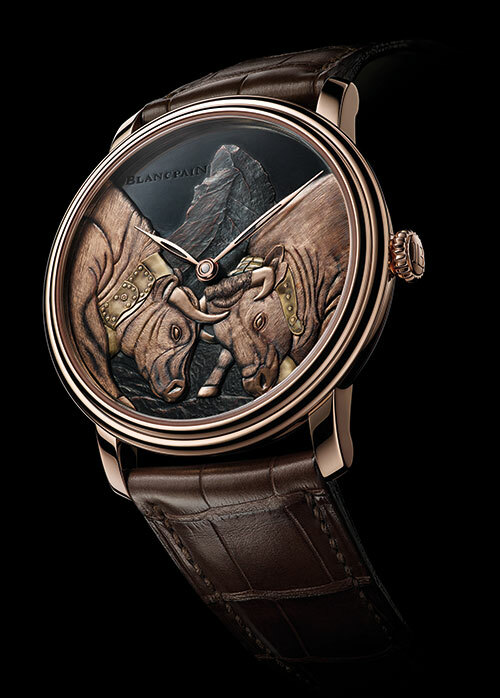 Along with the brand logo, it is hand-engraved on the shakudo dial, while the cows’ yellow-gold collars are damascened with red-gold appliqués. 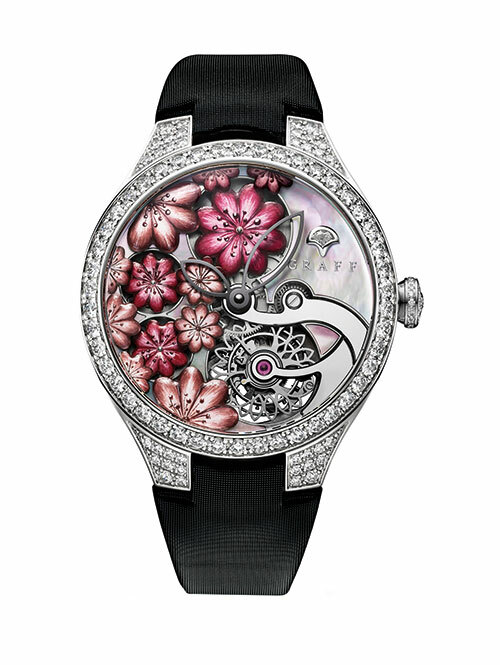 An illustration of the brand’s savoir faire, the highlight of the MasterGraff Floral Tourbillon is a dial made up of flowers that are created using a challenging ancient method. After being cut by hand and dyed through fire enamelling and hand painting, they are rendered on a mother-of-pearl dial — a process that takes up to 50 hours to complete. And, if that feat wasn’t enough, the flowers at 8, 9 and 12 o’clock also rotate with the movement of one’s arm.